Nathan Skytta is back again — this time with predictions for the first round of the NHL playoffs. For the first time in almost 20 years, the Detroit Red Wings will not start their run towards the Stanley Cup at home in front of the fans at Joe Louis Arena. In a season that was plagued with injuries, featured a rookie between the pipes, and contained league diversity with no real powerhouse, the Wings struggled out of the gates. Led by gold medal winning head coach Mike Babcock and a plethora of skill and determination, the Wings overcame their injuries and got their lineup back together. Oh and that rookie in net? Well, he turned out to be a possible rookie of the year finalist. The Wings finished fifth in the conference and are going to take on the fourth-seeded Phoenix Coyotes, in the first round of the playoffs. The Coyotes will put up a challenge for the Wings, but after finishing the season as one of the hottest teams in the league, the Wings should be favored in advance. In another matchup in the Western Conference, it’s the No. 1 San Jose Sharks versus No. 8 Colorado Avalanche — a matchup that will be worth watching. The Sharks barely missed having to face Detroit, but the road to the second round didn’t get any easier when they were paired up against the Avs. The Sharks need to be on their ‘A’ game in order to have any chance of advancing. The No. 2 Chicago Blackhawks will take on the No. 7 Nashville Predators. This may be the highest scoring series out of the eight first round playoffs because each team has struggling goaltenders and stars that can put up big numbers when given the chance. In the last Western series, it will be the No. 3 Vancouver Canucks facing off against one of the scariest teams in the league, the No. 6 Los Angeles Kings. Both of these teams have great goaltending, but it will be the matchup of the Kings defense against the all-star duo of the Sedin twins that determines who comes out victorious. The Kings are the Cinderella team of the NHL this season and are unpredictable, so this series is one worth watching. In the Eastern Conference, it’s the President’s Trophy winning Washington Capitals versus the Montreal Canadiens. This matchup pits Capitals starting goaltender Jose Theodore against his former mates from Montreal. The Capitals have too much firepower for the Canadiens and should win this series convincingly. Future Hall of Fame goaltender Martin Brodeur will lead his No. 2 New Jersey Devils against the No. 7 Philadelphia Flyers, in hopes of clinching another Stanley Cup title. This is the time of year where Brodeur seems to always step up his game — just what any team wants to hear when facing the goaltender with the most wins in NHL history. Silver medal-winning goaltender Ryan Miller and his Buffalo Sabres face the Boston Bruins and their rookie goaltender Tuukka Rask. The Bruins are going to have a challenge beating Miller and his teammates, so the Sabres should easily win this series, but at this time of year, anything is possible. Last but not least, it’s the No. 4 Pittsburgh Penguins versus the No. 5 Ottawa Senators. Both teams struggled down the stretch, but the reigning Stanley Cup Champion Penguins should advance. Sidney Crosby and Evgeni Malkin should lead the charge against the Senators, who lost their star Alex Kovalev to a torn anterior cruciate ligament this past week. The Senators have a challenge ahead of them, but hopefully they can make it an interesting series. 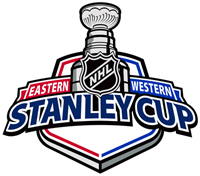 Anything can happen in the first round of the NHL playoffs, so tune in and see some of the exciting hockey that the last 16 teams in the league have to offer. Versus and NBC will have all the coverage starting Wed., April 14. My name is Ray, and this is my Sharks blog. I’ve branched off from doing all sports to focusing on the Sharks this year. I give you the perspective of a fan with emotion and honesty; I also try and use a professional setup for consistency. There’s a small possibility I may post a blog on one of my other teams, or re-post an article I write elsewhere. So, sit back and just be a fan of the game. I’d also like to reach out to Sharks fans, hockey fans or anyone else. Please leave a comment and let me know what you thought of a post or any input you’d like to add. It’s encouraging to receive any feedback or know people got something out of it. So tell your friends, post my URL on your facebook status, whatever. You can also link your blog by using comments, too. Help build a community!